Seven to ten disabled people are invited to take part in free tape art workshops, held over three days. This is a great opportunity to learn new skills from Tape Art New Zealand, an internationally recognised public art team. Workshops will focus on developing techniques in figure drawing and mural making to tell our stories. 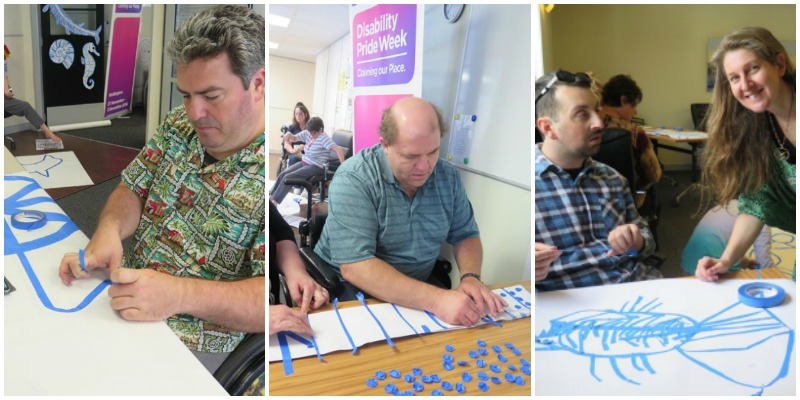 This team will collaborate to create a temporary mural that celebrates Disability Pride Week. Thursday 1 December, mural drawing, 10am–3pm, be Ngā Taonga Sound & Vision, the corner of 84 Taranaki Street and Ghuznee Street, Wellington: includes one hour lunch break. Participants need to commit to all three days. Places are limited so book now by contacting Rachel Noble on 021 410 300 txt only or email rachel@ennoble.nz. Original generation time 1.2100 seconds. Cache Loaded in: 0.0413 seconds.